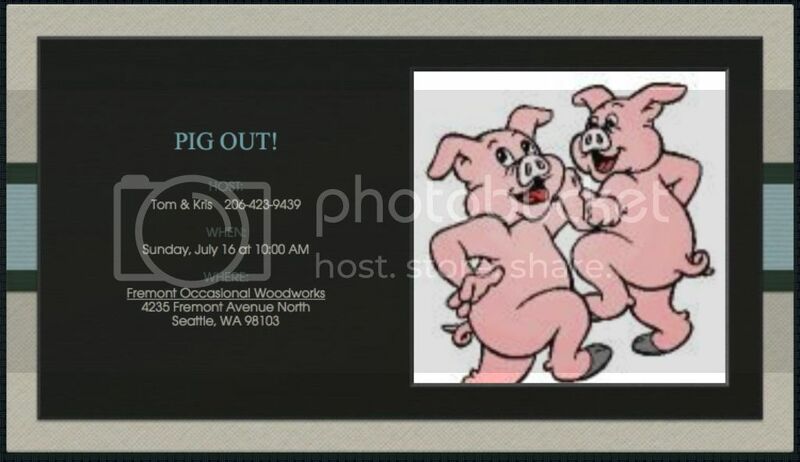 WWA Info Exchange • View topic - Pig Out! We decided to try a later date than previously, in hopes that we'll have better weather. Although, we now have a new picnic shelter, so weather should be less of a problem in any case. The pig goes in the box at 11:00AM, we start eating around 3:00PM. Stop by anytime after 10:00AM. If you don't want to miss the pig emerging from the box, it's best to show up before 2:30PM. We have lots of pig, if you have a side dish, dessert, or a favorite beverage, bring it along (pig roasting is thirsty work). As in previous Pig Out!s, we look forward to sharing with all our customers and friends. If you're not yet a customer or friend, but would like to become one, ...welcome! Post subject: Re: Pig Out! I was anticipating the event, Tom! Great. We plan on being there. I sure would like to get up that way, Tom. My friend Lawrence lives near there and I owe him a visit! I think he attended your last LUAU. I think I'll see if I can make a plan! Hope your healing up. Thanks for all you do! The hard work is done, the pig is injected with mojo crillo, and the skin side covered with kosher salt. All that remains is to remove the salt and light the fire. Sorry I can't be there. Take lots of pictures and tell us who they are. Dang slab leak happened at the worse time!! So sorry I can't make it. Discovered the slab leak yesterday morning....no way to leave it 'til repair scheduled for Monday morning. I was soooo looking forward to meeting you folks and enjoying the scenic drive up & back. Real Bummer! This year's Pig Out was a great success, thanks to everyone who showed up to participate. I was generally too busy to take pictures, but others did, so I'm looking forward to getting everyone's photographic contributions, please, thank you. I did get one important photo of the WWA contingent. From left to right are ReelinRon, Me (TMS), Jamie (forrestgirl), and Dennis. We'll be at it again in two years, so plan on it. Thanks TMS for the best tasting pig to be had on either coast................It was great meeting you, Dennis, Robbie and Jamie. If anyone is considering going in 2 years you will have great pig and some of the nicest people around! Thanks again, Tom, for hosting such a great event. I'll see about getting my photos off the phone and posted. Here's a couple more photos from one of our guests. I'll post more as they show up. Email them to yourself, save the picture to your computer. Then you can do it the regular way. I've tried that a couple times, Zulu, but for some reason my email server/host balks at large email attachments. I know there's a way to hook the phone up by wire to the PC USB port, just gotta look into it. But thanks for the suggestion. How many pictures are we talking about? You could email them to me and I'll post them for you. It's the least I can do. I'm just sorry I missed out on friends that I never met yet, pig, and beer. You can text me the pics. Not sure how well or even if it was successful but I attempted a text with photos attached. Here are Dennis' pics, just in.